There are two basic categories of debt owners: 1) the public, which includes foreign investors and domestic investors and, 2) federal accounts, also known as "intragovernmental holdings." Each category is explained below. 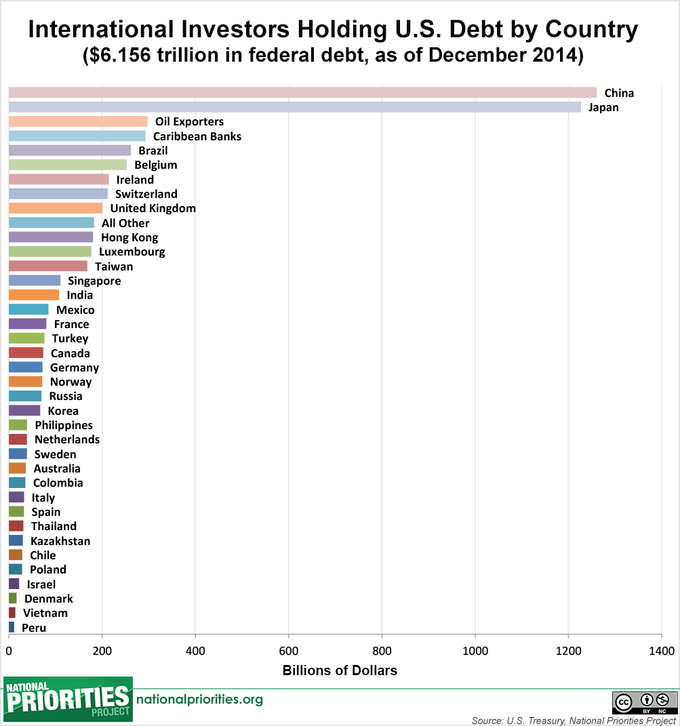 Thirty-four percent of the U.S. debt is held internationally by foreign investors (i.e. foreign governments, foreign institutions, and individual people in foreign countries) who buy our Treasury bonds as investments. The graph below ranks foreign investors' holdings by country. 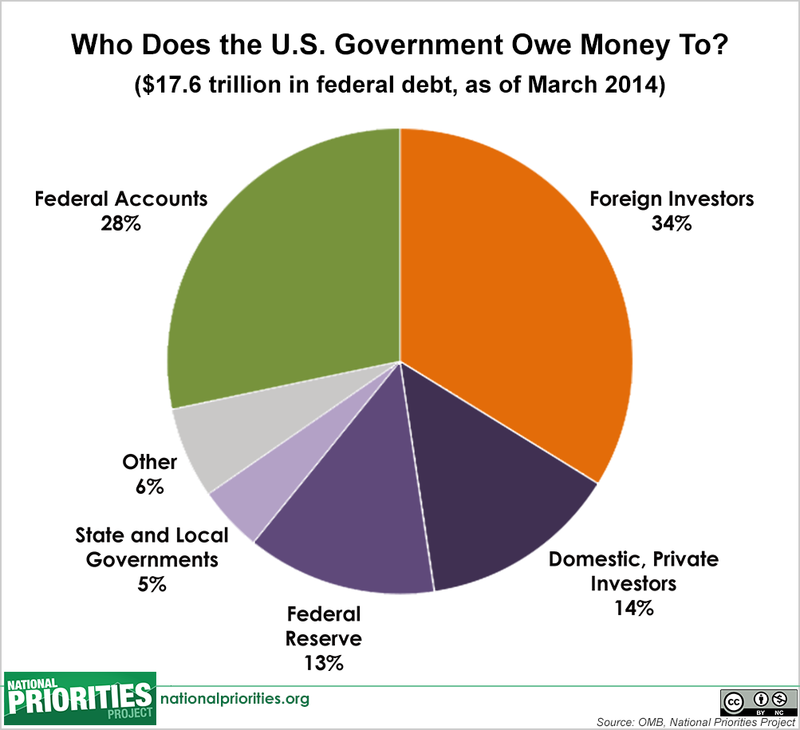 Public debt is also held domestically. 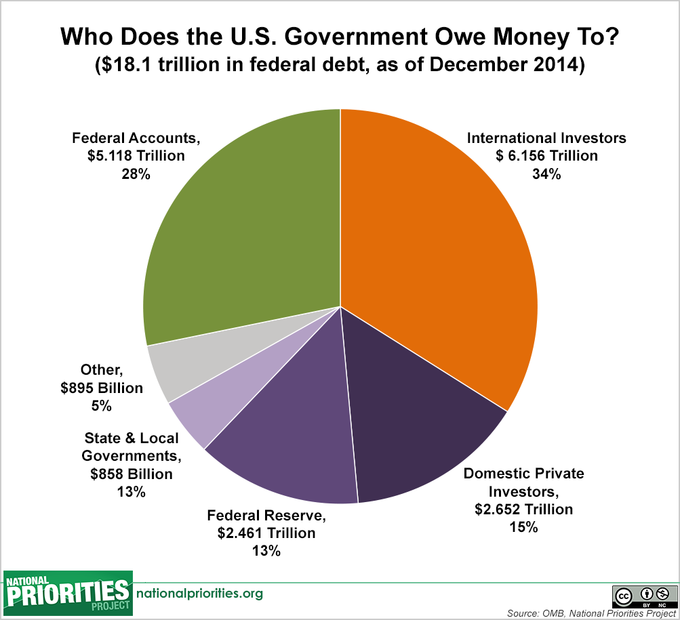 Domestic private investors - which includes regular American citizens as well as institutions like private banks - own 15% of the national debt. The U.S. Federal Reserve Bank buys and sells Treasury bonds as part of its work to control the money supply and set interest rates in the U.S. economy, so they hold some of the debt (13%). Finally, U.S. state and local governments have also lent money to the federal government, making them owners of 13% of the national debt. Debt held by federal accounts is not considered public debt - it is the amount of money that the Treasury has borrowed from itself. That may sound funny, but it means that the Treasury borrows surplus money from one trust fund and gives it to another trust fund. For example, the Treasury might borrow money from Social Security to finance current government spending in another area. At a later date, the government must pay that borrowed money back. Federal accounts currently hold 28% of the national debt. (Note: The Federal Reserve is not counted as "debt held by federal accounts" because the Federal Reserve is considered independent of the federal government).